The ability to place fertilizer and other soil amendments below the soil surface can be a powerful tool for producers in the Ohio area. Equipment that performs this function can vary in horsepower requirements, fertilizer placement capabilities, and may not always be best suited for the desired application. It is unclear in some cases the capabilities and suitability of these machines for farmers in Ohio. Below are a few considerations of the benefits and types of equipment available on the market today. • Placing fertilizer in a position readily available for crop uptake. • Can potentially reduce pre-plant field passes to a single operation, thereby conserving fuel and reducing compaction. • Strip-till sub-surface placement equipment allow for optimal seedbed preparation which increases planter performance. 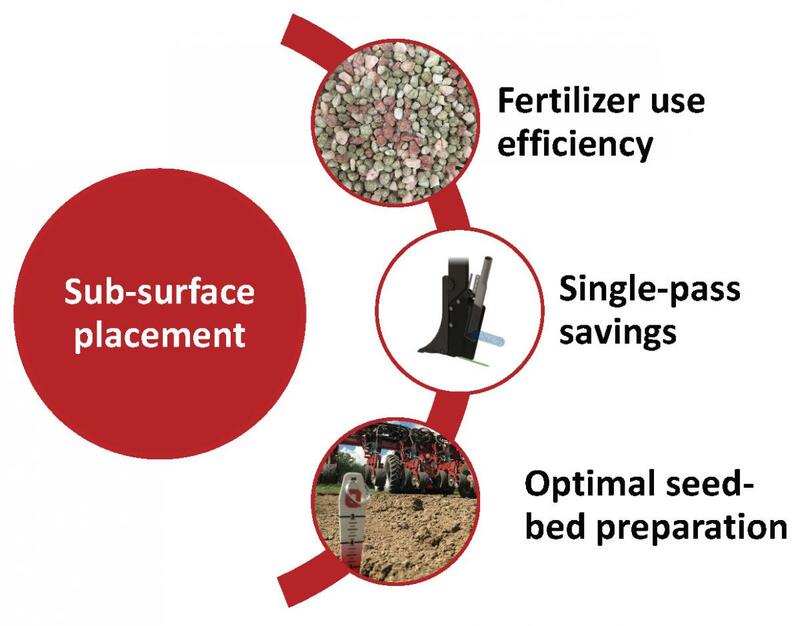 • Sub-surface placement can in some cases, reduce fertilizer loads in overland runoff. A: “Deep Rip and Placement” Equipment—applies a fertilizer band (generally 4–8") of liquid, dry, or anhydrous, prior to the growing season and usually involving some type of tillage or seedbed modification. Generally able to operate 3–6 mph in a minimal till to strip-till environment, typically induces more soil disturbance than “Zone Mixing” or “Injection” type equipment. 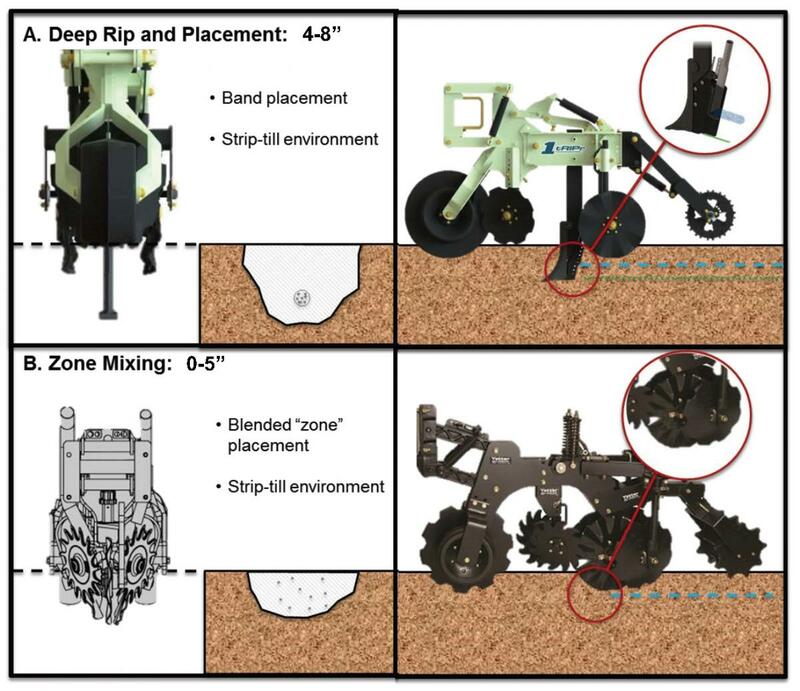 B: “Zone Mixing” Type Equipment—mixes fertilizer and soil in a tilled zone generally around a maximum of 8" wide by 5" deep. Typically uses a multiple coulter setup to induce a thorough mixing action on the soil while blending a liquid, or dry fertilizer or manure. Generally able to operate in the 7–12 mph range in a strip-till or similar environment. Typically induces more soil disturbance than “Injection” type equipment. 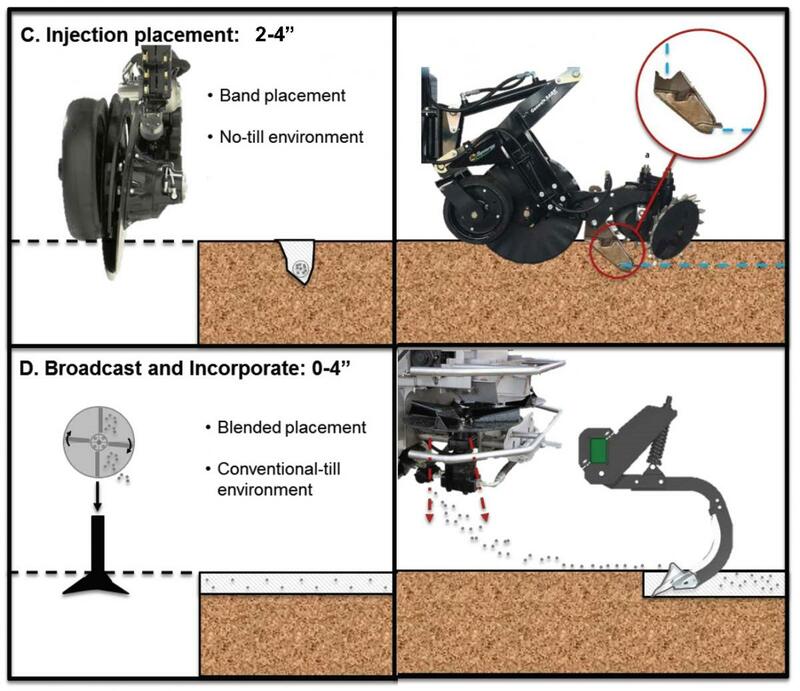 C: “Injection” Type Equipment—applies shallow narrow band of fertilizer (generally 2–4"), liquid dry or anhydrous, prior to the growing season or sometimes at side-dress. Typically employing some type of single coulter or similar style opener to open a slot for injection of fertilizer product. Generally able to operate in the 7–12 mph range in a no-till or minimal till environment. 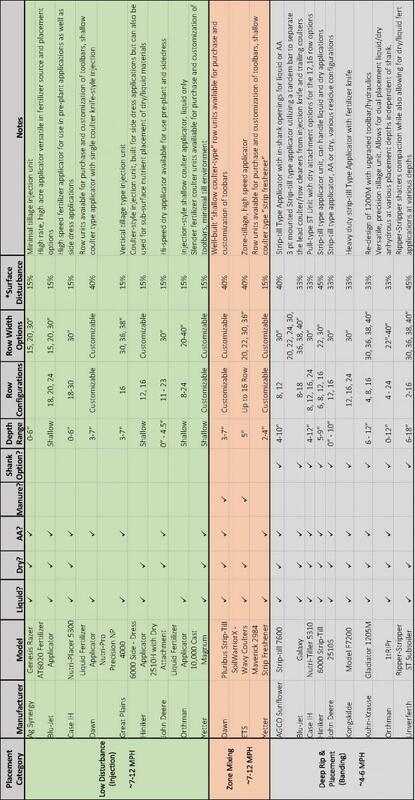 Typically induces less soil disturbance than the other types of equipment listed above. D: Broadcast and Incorporate—application typically conducted by a dual spinner-disc spreader, followed by incorporation by a disc, field cultivator, or similar tillage tool. Incorporation can be done any time after the broadcast application, but preferably within 3–5 days.